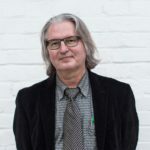 Bruce Sterling is an American science fiction author known for his novels and work on the Mirror shades anthology. This work helped to define the cyberpunk genre. "I do have two data identities. I have my name, Bruce Sterling, which is my public name under which I write novels. I also have my other name, which is my legal name under which I own property and vote." "I used to think that cyberspace was fifty years away. What I thought was fifty years away, was only ten years away. And what I thought was ten years away… it was already here. I just wasn’t aware of it yet." "My idea of an amusement park story is getting adventurers to go tour environmental disaster areas. After all, if the entire Great Barrier Reef gets killed, which seems like an extremely lively possibility, what are you going to do with all that rotting limestone?" "War as Napoleon knew it just not possible any more. However, we’re very unlikely to accept or recognize “world peace” even when we get it." "If politics and business fail us, of course the military will be called in. In the developing world, the massive and repeated ecological disasters are quite commonly met by the military."